This unlikely group of pond-life obsessives formed in the confines of a Bristolian industrial lift in 2002. The spawn of the Liftmen’s newt-ridden nucleus begs inadequate comparison with the likes of Prag Vec, Tortoise, Thee Headcoatees and Young Marble Giants but sounds a little bit like none of the above. Consisting of the core members Rasha Shaheen, Neil Smith, Jamie Whitby-Coles and Jesse D. Vernon a fully formed Liftmen first knocked on Twisted Nerve’s door in 2005 armed with the concept of playing ‘songs of beauty (songs of terror)’ making their label debut on the pocket sized second-class-tome ‘Now Is The Winter Of Our Discount Tents’ compilation. 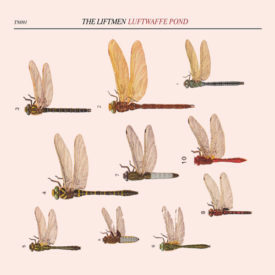 Recorded with Portishead’s Jim Barr and featuring guest vocals courtesy of Tammy Payne (Jukes) The Liftmen’s full length Twisted Nerve debut is in keeping with the label’s original singular minded and independent non-record label A&R policy of ‘releasing music that you wouldn’t hear elsewhere’. This fine subversive precedes the 10th anniversary of Manchester’s very own homemade and house-proud, singular minded and independent non-record label. Consistently jarring with the status quo our thoroughly unreliable and schizophrenic release schedules fits like a fingerless glove on an octopus whilst embracing the true nature of the independent record label with little regard to the impractical standards of the major music industry Twisted Nerve has conspired to bring you the closest thing to a community run industry with our privately pressed and handmade products.